Exercise is an important part of a healthy lifestyle. Proper nutrition is also vital to physical health and fitness. What you eat and drink effects as much as 60% to 75% of your level of fitness. 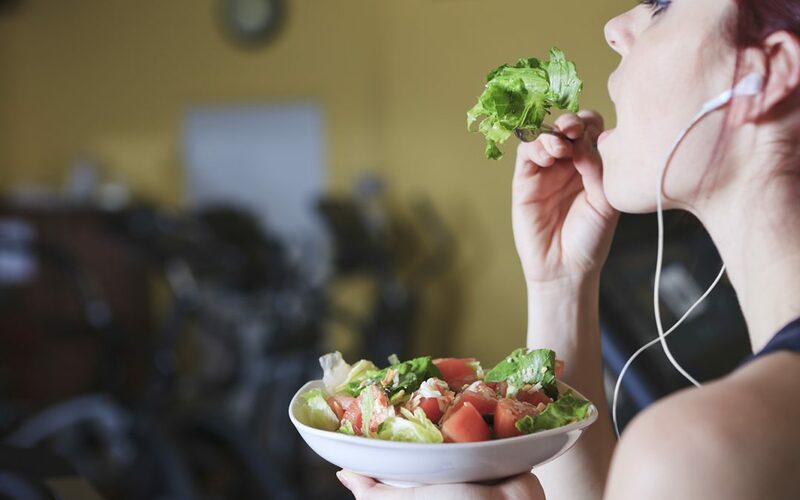 So eating right is definitely something you need to do to complement your exercise routine. When should you be eating in relationship to exercising? Fueling up 2 hours before any intense exercise: Drink water and eat a meal with healthy carbohydrates (e.g., whole grains or pasta, brown rice, vegetables and fruits. While protein is definitely required for building muscle, it should be avoided before your workout. Protein takes longer to digest, and could cause some discomfort while you exercise. If you only have a few minutes before you exercise and you haven’t eaten for some time, you should still eat something. Try a banana, apple or some other “easy to digest” fruit or vegetable to provide healthy carbohydrates if you only have 5 or 10 minutes before you workout. While You Exercise: Drink water throughout your exercise, no matter how intense. Small sips of water will keep you hydrated and performing at your best. You don’t need to eat while you exercise, unless your workout takes longer than an hour. An energy bar, banana or raisins can be consumed during vigorous workouts of longer duration, and you should aim for 50 to 100 cal for every half hour of exercise. After You Exercise: Drink lots of water after your workout is over. You also need plenty of carbohydrates and proteins. These 2 nutrition essentials help your recovery period (when your body grows stronger and builds more muscle mass). Between 30 and 60 minutes after exercise, eat a meal rich in protein and carbohydrates. Proper nutrition and exercise can lead to a long, healthy and happy life. Just remember that these general guidelines may need to be tweaked for the unique way your body works. Use the exercise eating tips above, adjusting them as needed for the best results in your life.